Breakfast in the hotel, joined by Sue and her accountant-husband, Herb, who was feeling much better. They got up earlier than they needed to in order to have breakfast with us. Picked up at 9AM by Joshua and our driver, Mohammed. First stop was the Victoria Terminus, a most impressive building from the outside, but rather disappointing inside. Hustle and bustle was not especially “bustlely” and there was no central hall to compare to any of many we’ve seen in the US. 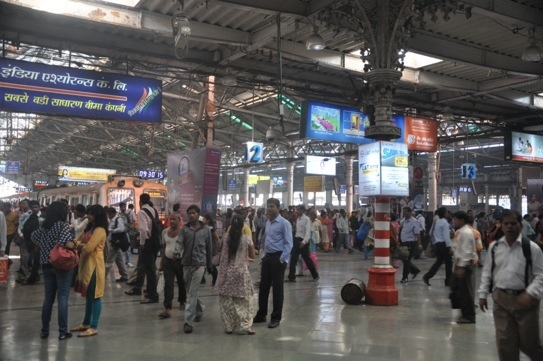 Still, the fact that about a million of Bombay’s five or so million daily railroad commuters pass through it is noteworthy. Joshua is quite involved in, and very knowledgable about, the Jewish community in India, which now is primarily in Bombay, where some 4000 live. He told us of the two communities in Bombay, an ancient one, of which he is a descendant, called Bene Israel which fled Israel when Antiochus came, and a Baghdadi community, which came from Persia much later. The Sassoon family was part of the latter group and acquired great wealth, first through the opium trade with China (for tea sold to the British), and later through textiles and then banking. Most of the Baghdadi community has now emigrated to England, the US or Israel. Hostility between the two Jewish communities no longer exists. The Sassoons were responsible for building two of the three synagogues we visited this morning, the Magen David and Knesset Elyahu. The other, Tipheteth Israel is a Bene Israel synagogue. All three were quite attractive, two of them having balconies for women congregants. 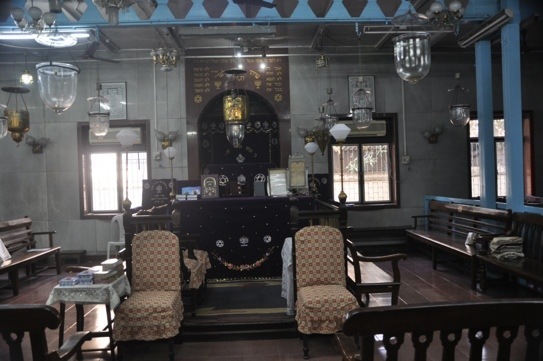 Joshua also spoke of the beautiful, but virtually defunct, synagogue we will see in Cochin, and of others, as well. He knew of the Bene Ephraim group that I spoke to Shonali about our visiting in the South, before I concluded that it would be too difficult to do for this trip. His friend, Sharon, who we met outside one of the synagogues, works for ORT in Mumbai and has visited and helped the very poor Bene Ephraim community. Unfortunately, we were unable to reach Sharon later to try to talk to him about Bene Ephraim. From the synagogues, we drove to see the Dhobi Ghat, an enormous cooperative open air laundry, similar to the one we saw yesterday, but much larger. 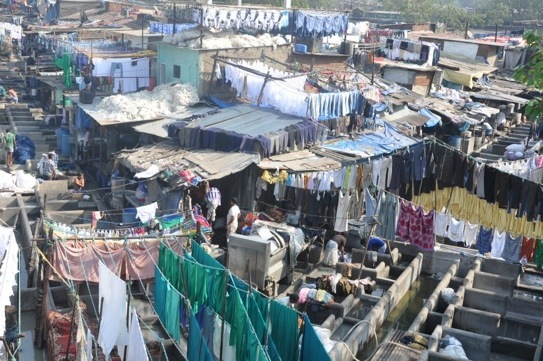 Laundry is collected by laundrymen, dhobiwallas, and brought to the ghat where different types of laundry is washed by different people and somehow sorted out through small markings and, rather miraculously, returned from whence it came. 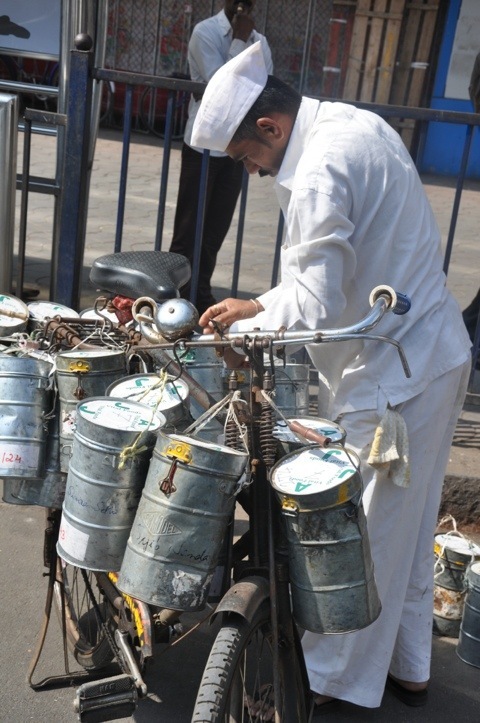 An even more amazing version of this type of business are the Dabbawallas, who we saw outside the Church Gate railway station. 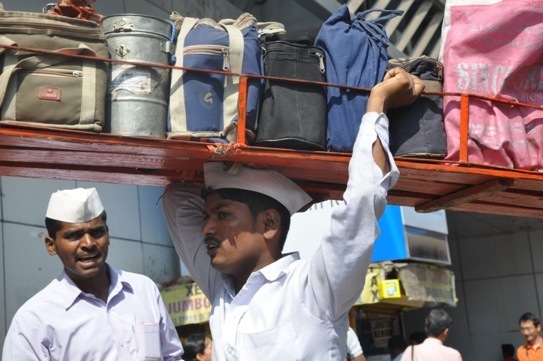 Every morning the Dabbawallas call on homes in the suburbs to pick up “Dabbas” or lunch boxes of home cooked food prepared for office goers who left at the crack of dawn to take commuter trains into the city. Transporting these lunches on local trains, they gather at Church Gate station to segregate them area wise before they are delivered. Each lunch box looks exactly alike, but without any modern technological equipment, more than 50,000 lunches are delivered on time daily to the correct recipient. It is a system based on memorized codes and leg muscles as they load multiple boxes on to coffin size trays and rush them through the chaos of Mumbai to the correct offices, usually on bicycles. 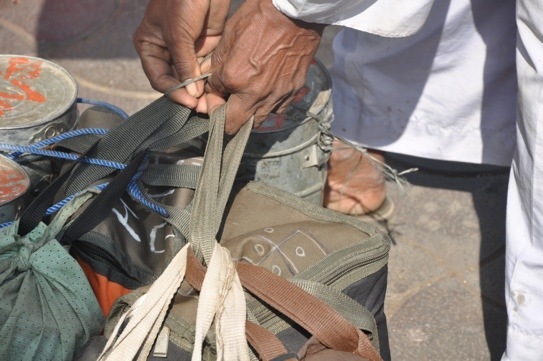 The Dabbawallas have been studied by The Harvard Business School as an example of teamwork. It is truly amazing to see. As we were watching them, who should pull up in another car but Sue and Herb, our breakfast companions, and their guide Hanna–who happens to be Joshua’s wife! We think Joshua is terrific, have exchanged contact information and hope to stay in touch. We visited a couple of other modern art galleries with little success, so we abandoned the effort and instead headed for the vegetable, textile, pet and gold markets, walking around to observe and photograph. We returned to the hotel to pack up, blog, email and have a short high tea, before being picked up to head for the airport for our 6:45 flight to Aurangabad. Driving here is harrowing, a constant beeping of horns, with four lanes regularly converted into six as cars, tuk-tuks and motor cycles stratal the lane markers, which appear to be mere suggestions. We marvel that we don’t see the roadways strewn with the bodies of the unhelmeted motorcyclists who weave in and out at high speeds. Mumbai is quite an appealing city, and I’d happily return, as we have just scratched the surface. It’s location on the water gives it an open feel that Delhi lacks. Flight to Aurangabad is short (less than an hour) and uneventful. Our hotel, the Taj Residence, is quite nice, but pales, as almost every hotel in the world would, as compared to the Taj Palace in Mumbai. Security is serious. After checking in, we have a really excellent meal outdoors at the hotel, then return to the room to retire. I found the Sassoon Bombay connection interesting. Philip Sassoon, a descendant of the Sassoons who came to Britain, owned Trent Park, which is now a wonderful country park close to us. The poet Siegfried Sassoon – a favourite of mine – was also a descendant. I’d heard there was an Indian connection, but assumed it was part of the British Raj. Turns out the Sassoons had fled from Iraq to Bombay pre-Raj. I’m finding your trip very educational as I sit here in Barnet! I am following your trip while sitting near a window overlooking our frozen lake. Check with your guide about the original construction of the old part of your hotel. I would be interested in learning whether it is the same as the one I was told back in 1978 on a stay there. It was hilarious. Fascinating. Who are the Dabbawallas? Are they some sort of a kinship group/clan, or is the word just a job description? I imagine that social cohesion might help to reinforce the complex memorization. I wonder if anyone in Walla Walla, WA will ever think of starting something like this? They might win an alliteration award.